Skill Acquisition and Training describes the building blocks of cognitive, motor, and teamwork skills, and the factors to take into account in training them. The basic processes of perception, cognition and action that provide the foundation for understanding skilled performance are discussed in the context of complex task requirements, individual differences, and extreme environmental demands. The role of attention in perceiving, selecting, and becoming aware of information, in learning new information, and in performance is described in the context of specific skills. A theme throughout this book is that much learning is implicit; the types of knowledge and relations that can profitably be learned implicitly and the conditions under which this learning benefits performance are discussed. The question of whether skill acquisition in cognitive domains shares underlying mechanisms with the acquisition of perceptual and motor skills is also addressed with a view to identifying commonalities that allow for widely applicable, general theories of skill acquisition. Because the complexity of real-world environments puts demands on the individual to adapt to new circumstances, the question of how skills research can be applied to organizational training contexts is an important one. 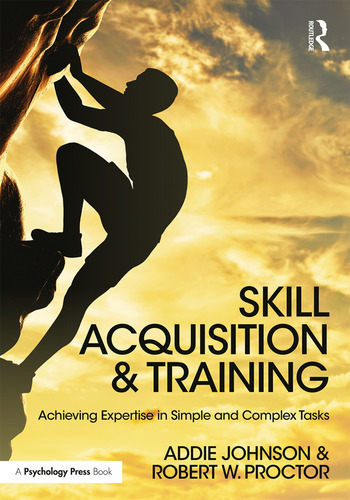 To address this, this book dedicates much content to practical applications, covering such issues as how training needs can be captured with task and job analyses and how to maximize training transfer by taking trainee self-efficacy and goal orientation into account. This comprehensive yet readable textbook is optimized for students of cognitive psychology looking to understand the intricacies of skill acquisition. Addie Johnson is Professor of Human Performance and Ergonomics at the University of Groningen. She is co-author, with Robert Proctor, of Attention: Theory and Practice, and Neuroergonomics: A Cognitive Neuroscience Approach to Human Factors and Ergonomics. Her research focuses on the intersection of memory and attention. Robert W. Proctor is Distinguished Professor of Psychological Sciences at Purdue University. In addition to the books with Addie Johnson, he is co-author, with Trisha Van Zandt, of Human Factors in Simple and Complex Systems (2nd ed.) and, with Kim-Phuong L. Vu, of Stimulus-Response Compatibility Principles: Data, Theory, and Application. His research focuses on basic and applied aspects of human performance.